... I'll get all philosophical on your asses. 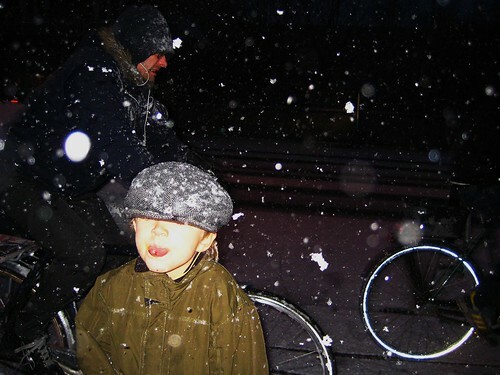 Felix, in the photo at the top, is tasting snowflakes while cyclists plow through the snow behind him. 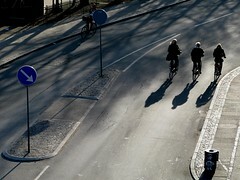 Which made me think... can we taste the weather on our bicycles? On a below zero morning, the cold winter air catches in our throats and chills our lungs. I love it. Getting to the throat and the lungs, the air has to pass the tongue. I am quite convinced that I can taste the cold air - crisp and sweet all at once. And what of the morning light? Does it not possess a taste all it's own? I don't think I can HEAR the light, but tasting it... oh yes. What does it taste like to you? A peach? A freshly baked roll from the oven? Or the low, melancholy light of evening, for that matter? I was reminded of one sure taste experience. Riding home from the beach on a hot summer's day you may catch yourself licking your lips and tasting the salt of the sea after a swim. And the sweetest taste of all. A kiss. Can't forget that one. Taste is a tricky one. Feel free to contribute your thoughts in the Comments section. I'm totally with you - stealing a kiss from your partner whilst you wait on your bikes at a set of traffic lights is a great taste whilst cycling! One thing I notice on my bicycle is the subtle differences in weather as I ride along. How about the taste of skunk? I get that now and then on my bike. Not only do you take great pictures, you are a great poet too! I usually eat my breakfast cycling to work. A simple rugbrødsmad (open faced rye bread sandwich)with cheese or honey. I don't know if it adds to the culinary quality of the meal, but I love the wind in my face as I eat. For me, riding a bike is the journey, but food and drink with friends are the most prized destinations. In many cases it is the anticipation of taste that is the motivator to get on my bike. GaJol is definitely my favored taste of cycling on a cold, rainy Danish fall day. I also ate a few Frøsnapper, in the rain, while cycling to meetings in Copenhagen. It was much easier than I thought it would be. I just had to say what a gorgeous post this is; really lovely in its sensuality! I don't really have anything to add because, honestly, I've never thought about taste whilst cycling. 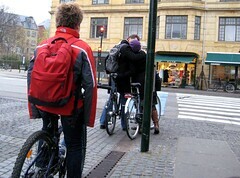 I would love to steal a kiss from a fellow cyclist, though that sadly has never happened. I do occasionally stick a mocha in the cup holder on my bike. 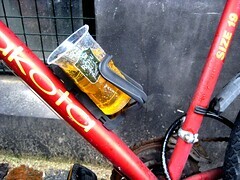 That's a lovely refreshment on a leisurely bike ride. I'm loving these posts. Have we done smell yet? I've forgotten! I'll look. If not, I SO look forward to that one. I love the metallic taste that I get on my tongue when the fog rolls in near my house while I fly down our hill. Or the taste of the air outside the bakery I ride by some mornings. Coffee always tastes good from the saddle. Or is it just that we all have such good taste for riding bikes? Raquel, comme to Montréal (especially last winter with pretty much nonstop snow from November to March) (!!!! - not usual, that) and we'll cure you of any love of winter. Especially if you love beautiful clothes. So do MontréalaisEs, but last winter we pretty much gave up. Very depressing. That said, it was a magnificent autumn day today and I had time to go for a good bicycle ride, still dressed like a human being. wonderful comments, the lot of them. Like a few others, my bike often brings me in relation with good food and drinks. I ride there with the anticipation, and I ride back with the flavours still in my mouth. And while I don't always have them strictly in the saddle coffee and ice cream (depending on the weather!) are often companions to my bike rides. lagatta: Don't be so hard on the winter! I like winter, usually until sometimes in mid-January or February, at which point, I wish for the summer to be back. But it's still quite lovely, and I prefer it much to the "wet season" locales with oceanic climates have. I will make sure not to close my eyes when tasting snow on my tongue while riding!